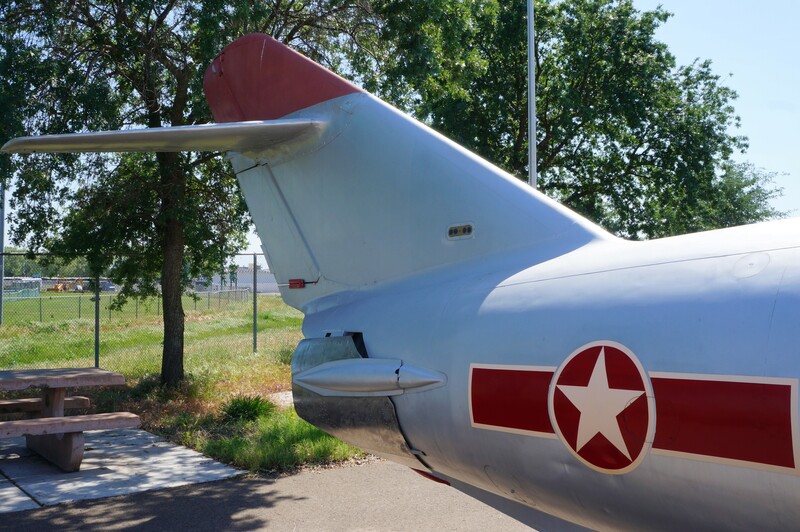 My last post on the Aerospace Museum of California featured planes parked outside in the four-acre Air Park. I’ll start out there again and then move inside the air-conditioned 37,500 square-foot Hardie Setzer Aerospace Pavilion to cool us off in this heat. 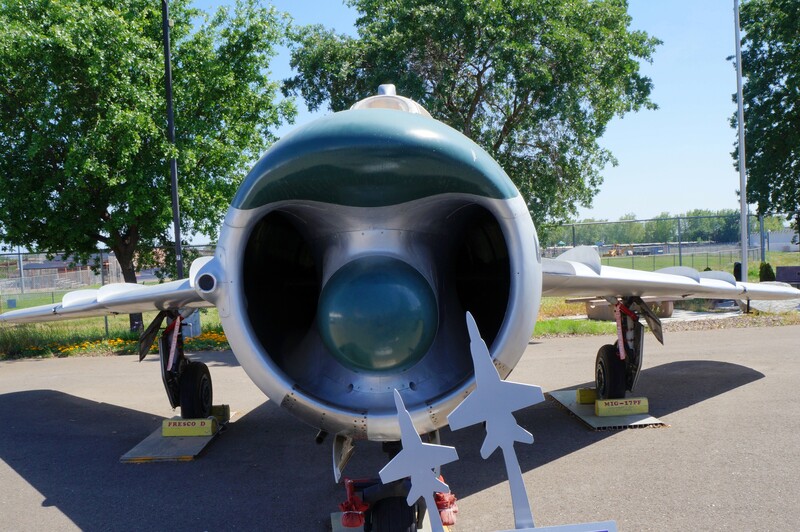 There is no mistaking the gaping maw of the North American F-100 “Super Sabre”, first fighter to be supersonic capable in level flight. 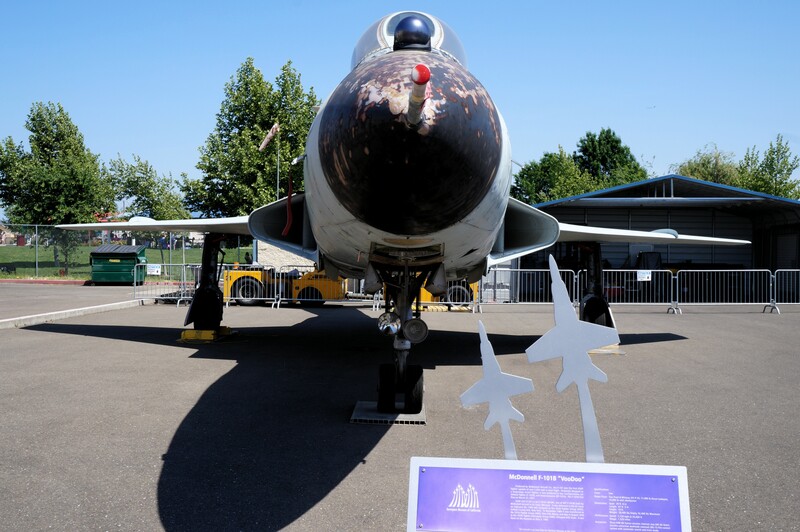 A troubled early operational start led to mods such as a taller fin and rudder. 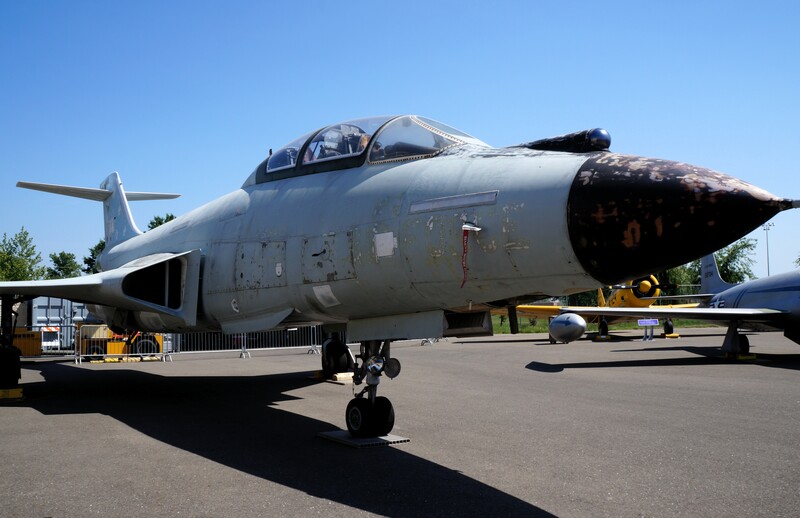 Early Vietnam War ground support and SAM missile suppression (Wild Weasel) missions showed the F-100 to be a bit light and it was replaced by the F-105, the A-7 Corsair II, as well as by the Phantom. 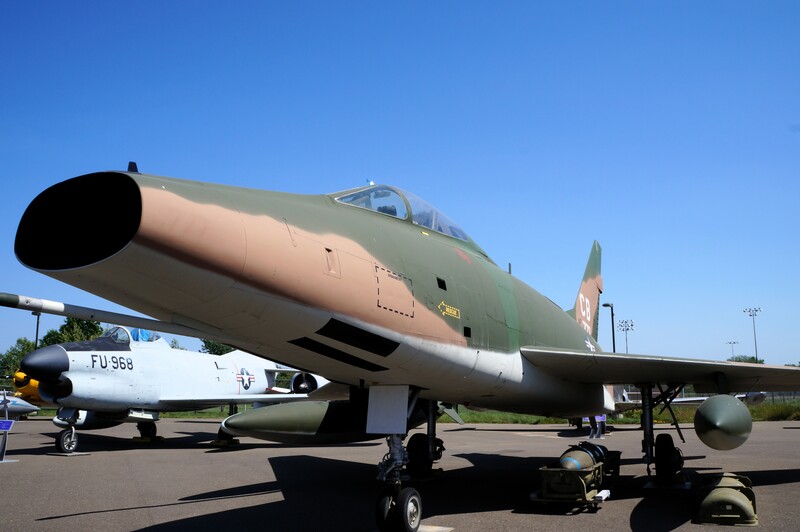 The F-100’s near contemporary was the MiG-17, NATO code named Fresco. 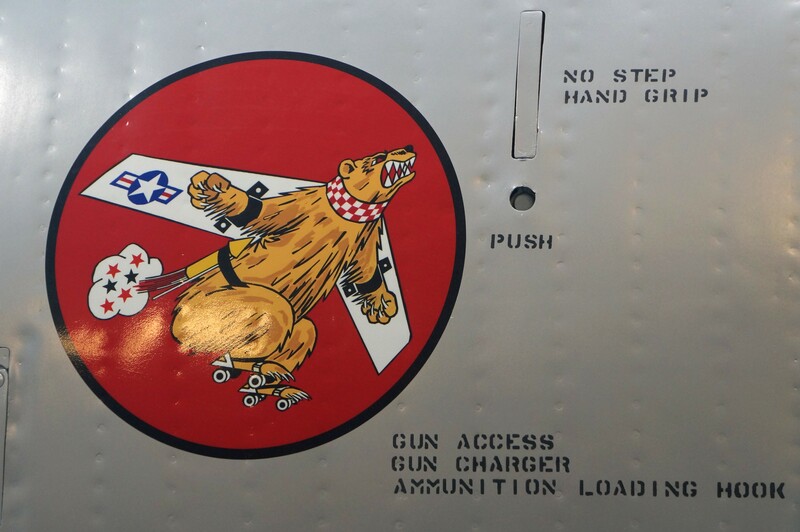 Though subsonic only, they were a mortal danger to bomb-laden fighter-bombers in Viet Nam using ambush tactics, out-turning and blasting them with heavy cannon. 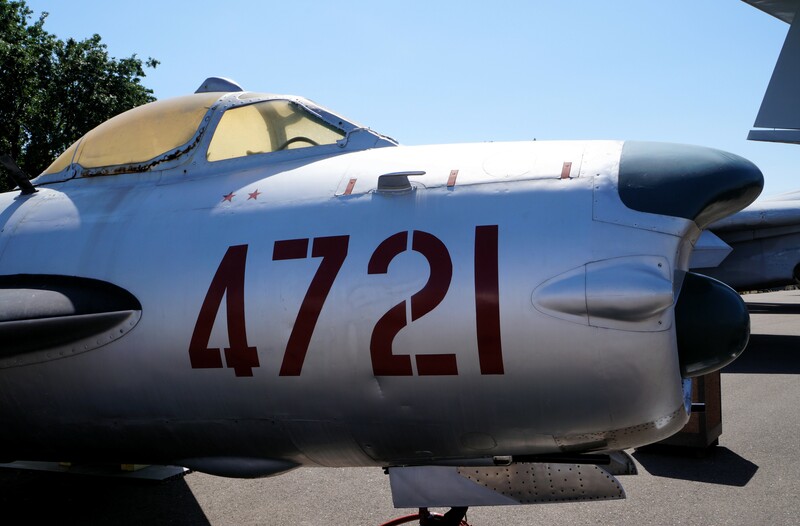 Forced to jettison munitions and fight for their lives, US pilots were usually successful, a total of 104 MiG-17s were shot down by American fighters during the Viet Nam War. But they took their toll, ruined bombing missions and were cheap to replace. 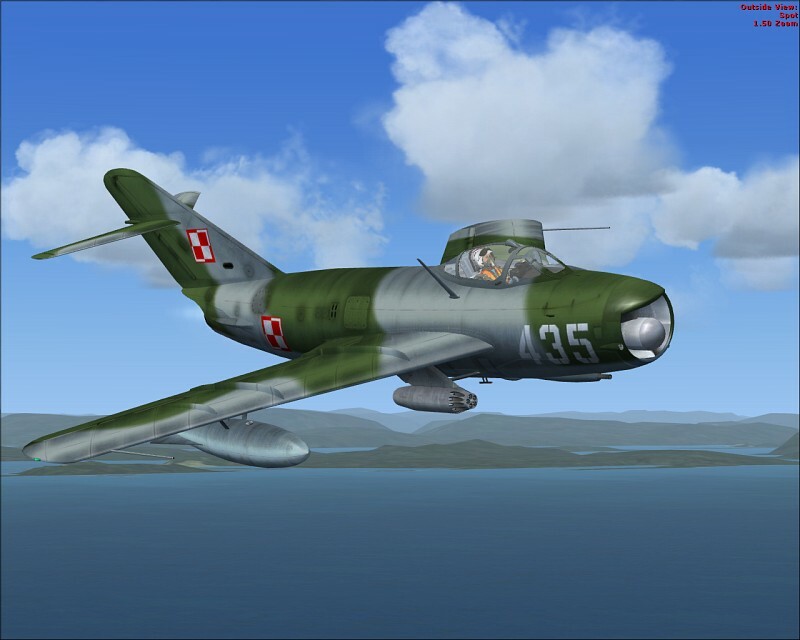 The cheap Communist planes seem to corrode faster than the western types, they were generally more crudely built in larger numbers and were seen as somewhat expendable and not expected to last long in combat anyway-plenty more where they came from. 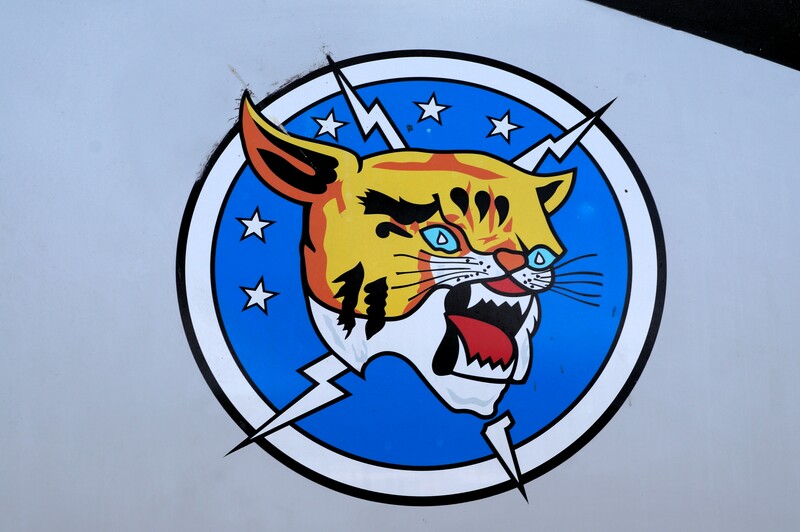 But all neglected aircraft degrade. This McDonnell F-101B Voodoo bakes in the sun awaiting its coat of museum quality paint. Most of the planes here look better than when they were in US military service however, perfect paint seldom being a high combat priority. 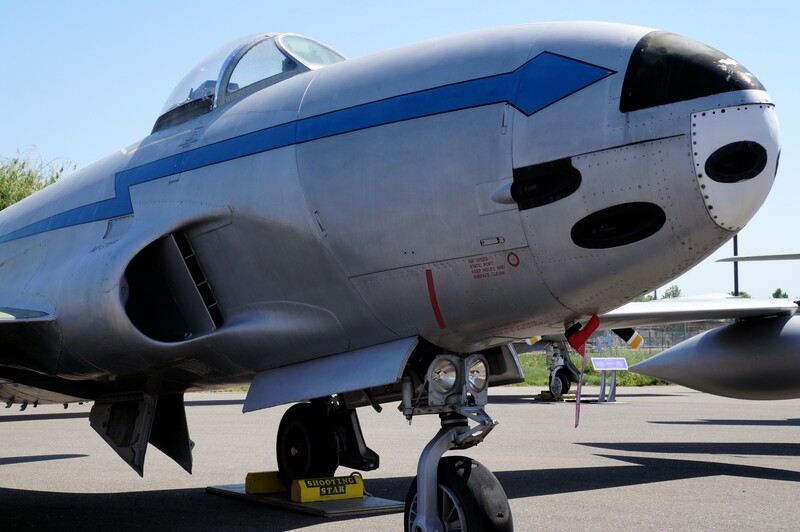 The Lockheed F-80B pictured here was the USAF’s first successful operational jet fighter. 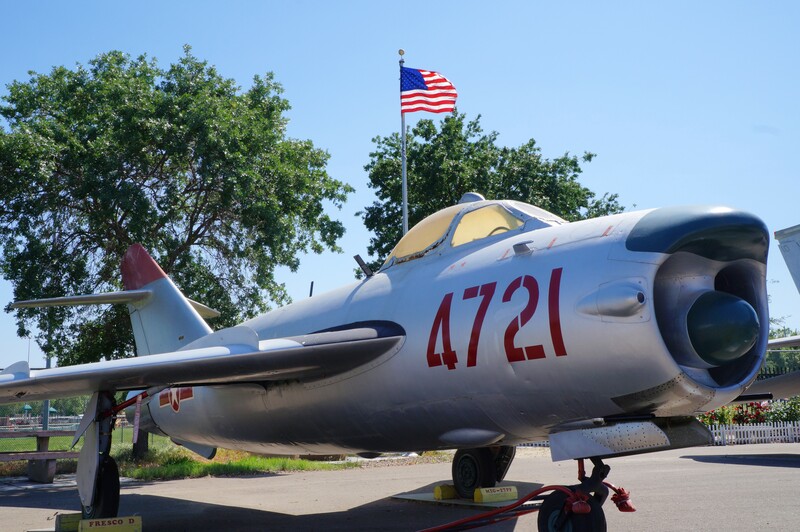 Though designed as an interceptor, its slower, older, straight wing design consigned it in Korea to mostly ground support roles, although in the first jet versus jet combat, an F-80C shot down a MiG-15 fighter. 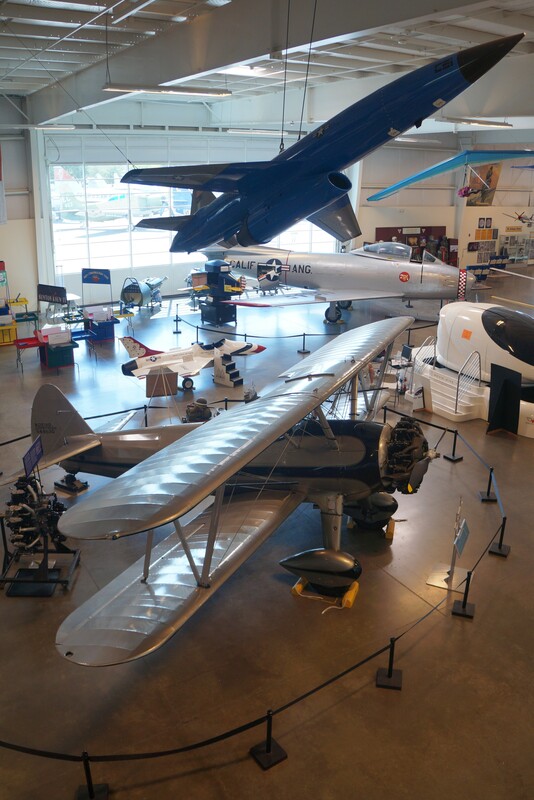 The 37,500 square-foot Hardie Setzer Aerospace Pavilion was thankfully lots cooler than the ramp with a balcony affording great overhead views of the exhibits. 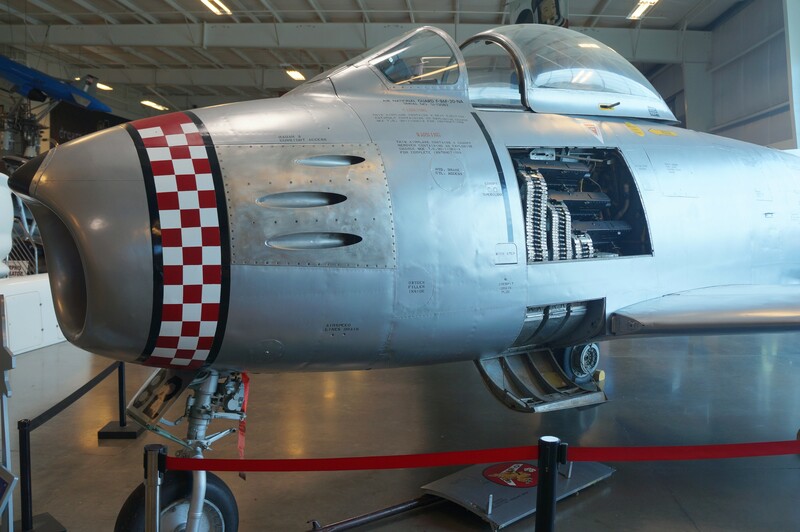 This shows the canted installation of the three left side .50 cal (12.7mm) M2 heavy machine guns used on the F-86 Sabre jet-there were three more on the right. Though WWII era, the armament was still quite effective due to superior US gunnery training and the F-86’s radar gunsight. 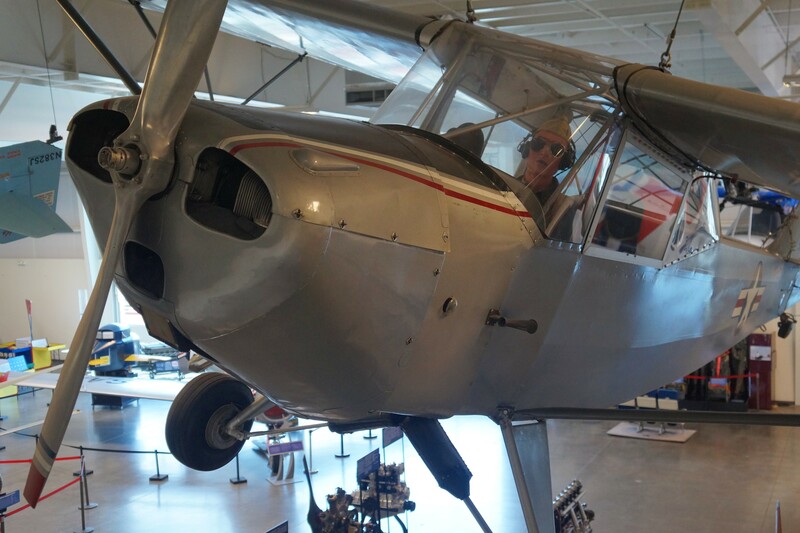 All the WWII two-seat liaison or observation planes supplied by Taylorcraft, Piper or Aeronca were called Grasshoppers and they proved their worth in every theater of war. 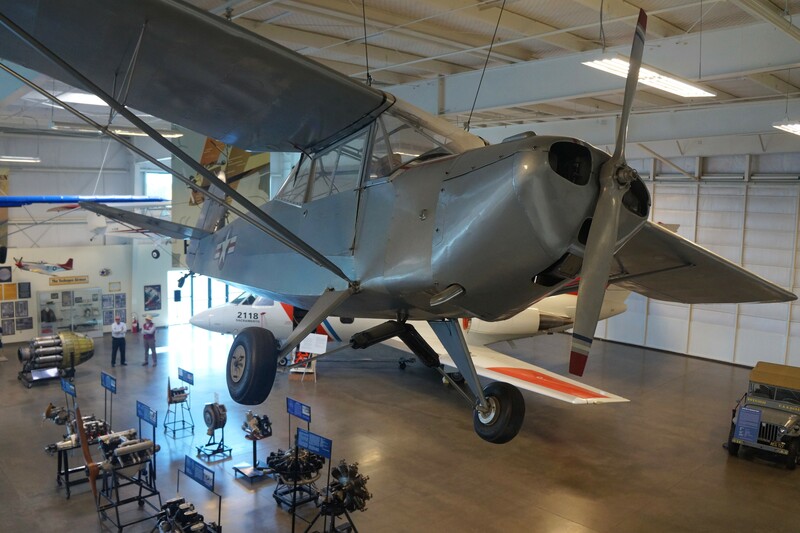 The museum’s Ohio-built Taylorcraft L-2M was delivered in 1943 and served in the Civil Air Patrol. I served in the Civil Air Patrol while in high school in the late 1960s. Mostly we took our converted USAF ambulance up in the Sierras to spray paint existing mountain plane crashes with giant orange ‘X’ marks to show they were old. It was fun but sobering, all that shredded aluminum on the rocks. 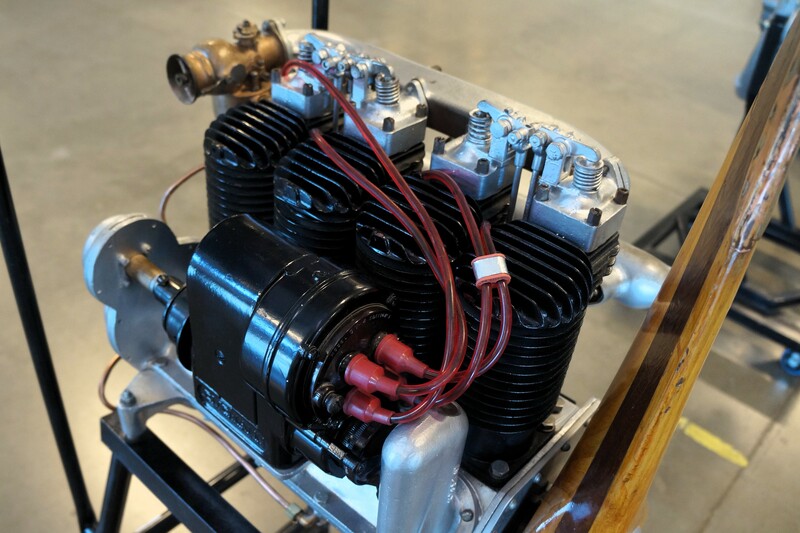 It’s not all military planes, this fiberglass/epoxy Rutan Quickie was designed to fly on only 22 horsepower (16.4 kW) though later models used the ubiquitous VW air-cooled 4-cyl. engine. Comparatively easy to build and fast, the Quickie landed fast too and the wing could suffer from rain or insect induced flow degradation. 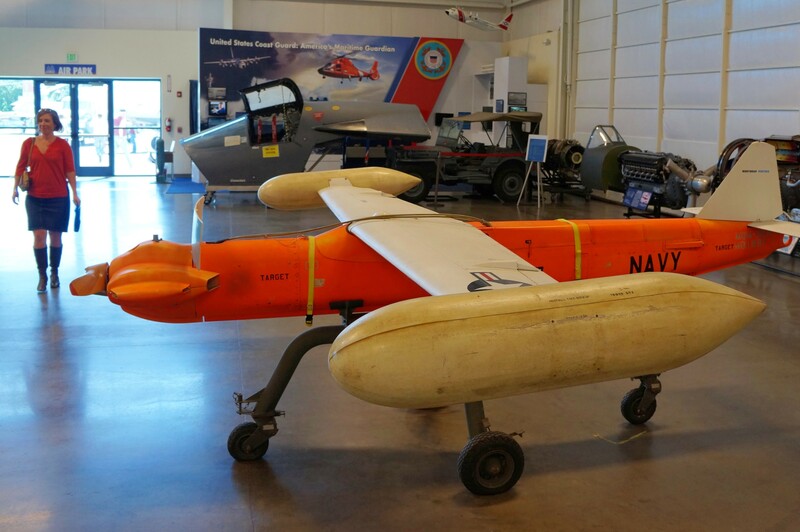 The blue missile hanging from the ceiling is a BQM-167 “Skeeter” aerial target drone. 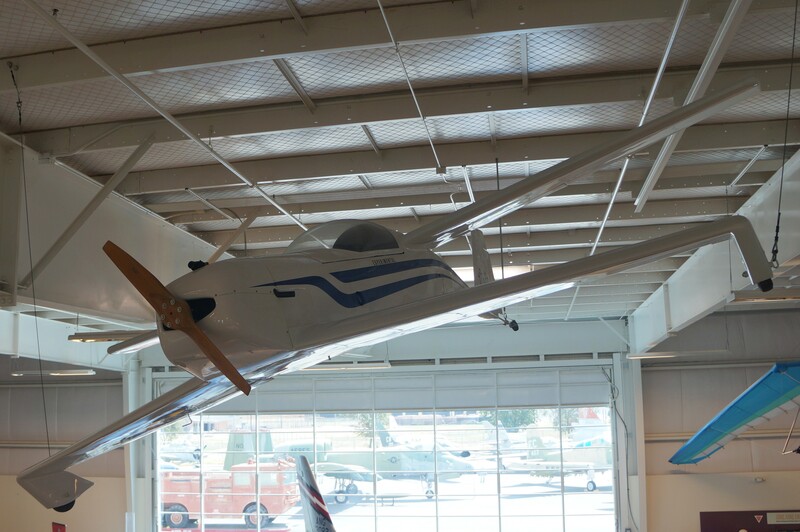 Made right here in Sacramento by Composite Engineering Inc., it’s capable of Mach .91 at 51,000 ft (15545m). It is saved for reuse by parachute after each mission. 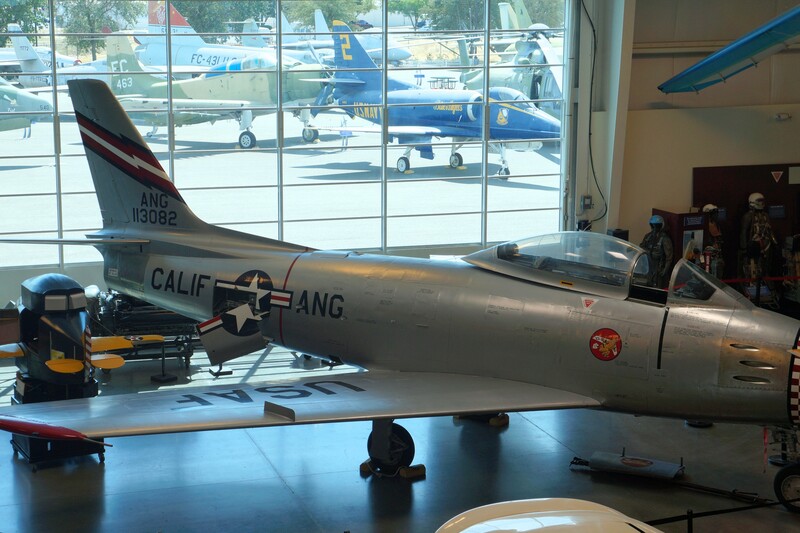 Below is the F-86 Sabre and at bottom is a Boeing-Stearman Model 75, the beefy and tough basic trainer which introduced so many pilots and aces to military flying. Yanking and banking here is the Pitts Special S-1C, A single seat, acrobatic bi-plane built in 1973 and raced until 1997. I can’t even touch here on the drones, cutaway aircraft, fine space displays with dioramas, models, spacesuits, space-food and actual spacecraft; or the history of women in aerospace; or the ground vehicles, simulators, paintings, models, flight suits, uniforms, patches, parachutes, bombs and shells, Norden bomb sight; numbers of complete and cutaway engines of all types from giant compound radials to Whittle centrifugal turbojet to Curtis OX-5 to this converted Henderson motorcycle engine. 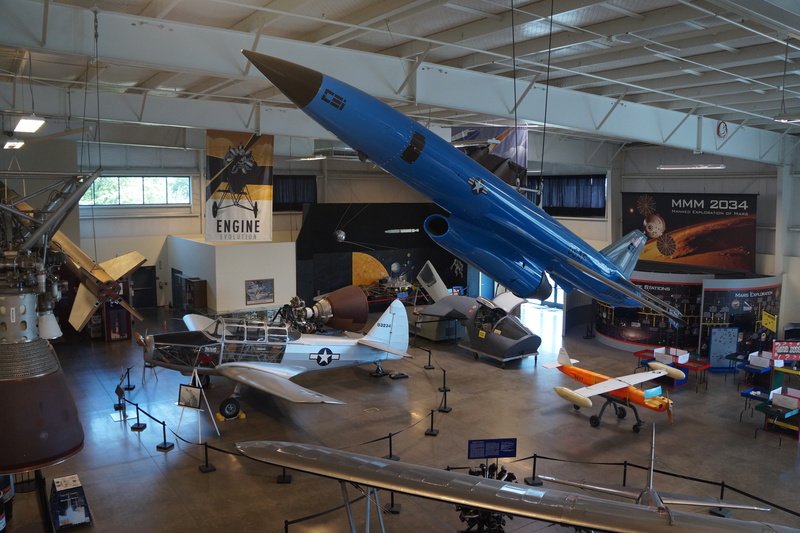 With over 40 aircraft on display and too many aeronautical exhibits to list, when in the Sacramento area, don’t miss the Aerospace Museum of California. 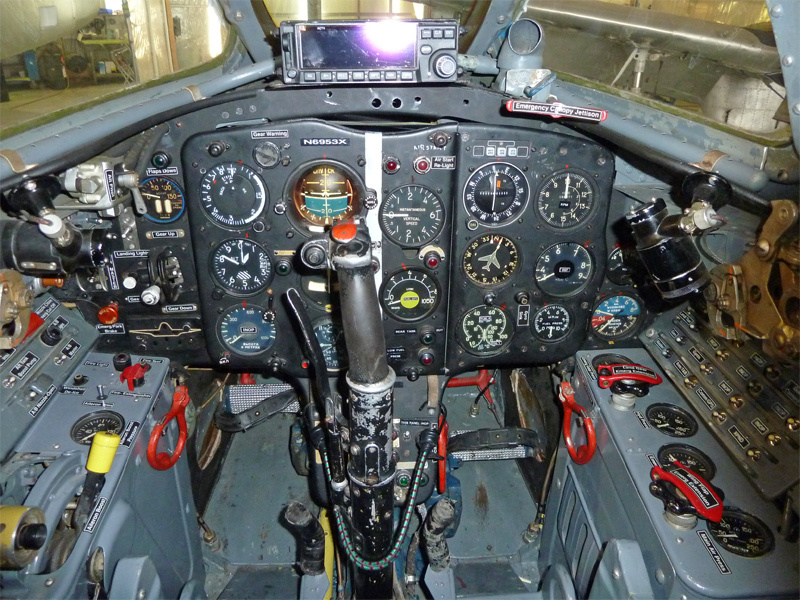 The docents are all veterans and often flew or maintained these same plane types on active duty. 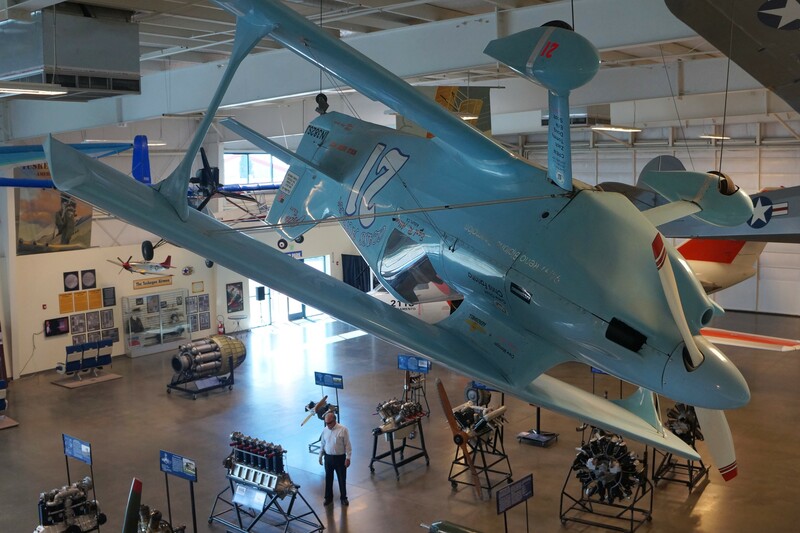 Open six days a week excluding Thanksgiving, Christmas, New Year’s Day and Easter Sunday; Tuesday through Sunday the Museum is open to the public from 10:00am to 4:00pm; adult admission is $8, over age 64 $6, under age 6 and active duty military free.